Hide away and play in an undersea world—a dimension of deepest, darkest blue, sparkling with mysterious sapphire light. 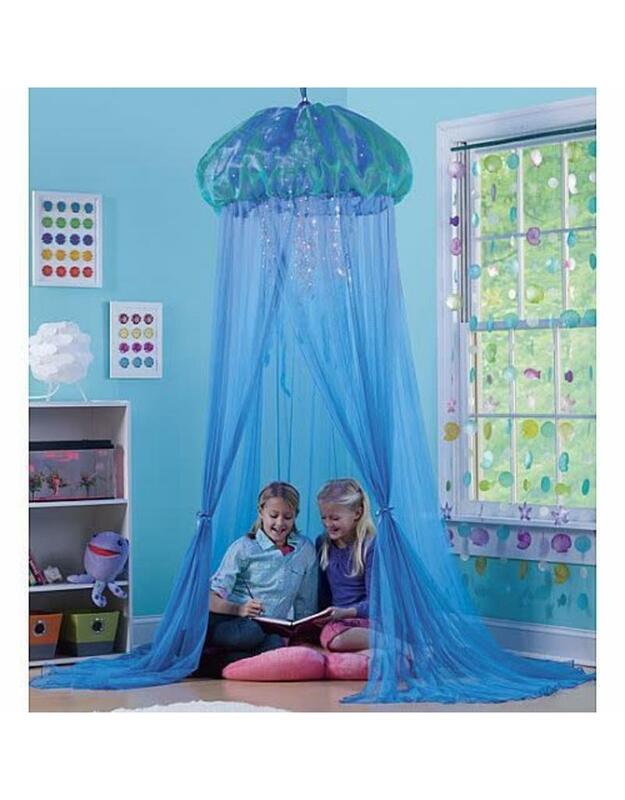 Jellyfish do (they have all the fun!). Enter their world through filmy, superfine deep-sea-blue netting crowned by a marine green cap. Cool blue ribbons and sinuous translucent streamers trail like tentacles within, entwined with sprays of mini LED lights (160 in all) handmade just for us in an intensely blue hue heretofore seen only by jellyfish eyes. Iridescent "pearl" beads add oceans of atmosphere to this incredibly versatile play realm. Approx.7'H x 24" diam. top hoop x 12' bottom circumference.Parents get to help kids arrange the sprays of plug-in lights; includes AC adapter.